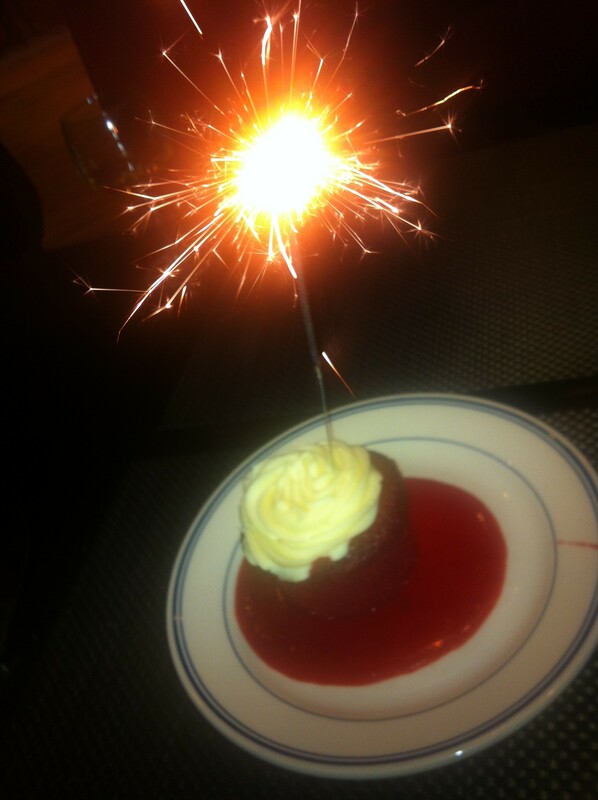 It wasn't just a coincidence that my mom and I were unexpectedly served a red velvet cupcake at lunch today. Red was his favorite color, and we served red velvet cake at his Celebration of Life. This was a message from him. The message was, BE ALIVE. One year ago today was Day Zero. The “before” was over; the “after” hadn’t quite started. One year ago today was the day that started with a quick trip to the pediatrician to get my son treated for a persistent cough, and to ask some questions about his unusual bruises. One year ago today was the day that ended with a diagnosis of leukemia. One year ago today I thought I would literally die from grief if one of my children died. But today, I am alive. Today, thanks to Julian, I understand more about being alive than I could have even imagined a year ago. And for that, I am grateful. One year ago today is also the day that I started Julian’s CaringBridge site. You can read about that day, and the days that followed, in my CaringBridge Journal. It’s been a while since I wrote a blog post. And I know people have been curious. How did the holidays go? How does it feel to be approaching the one-year mark? What does “normal” feel like these days? The answer to each of these questions is, it depends on the day. As I’ve said before, the best question to ask is, how am I … today? I’m happy to report that today was a great day. One of the best days ever, in fact. Today. 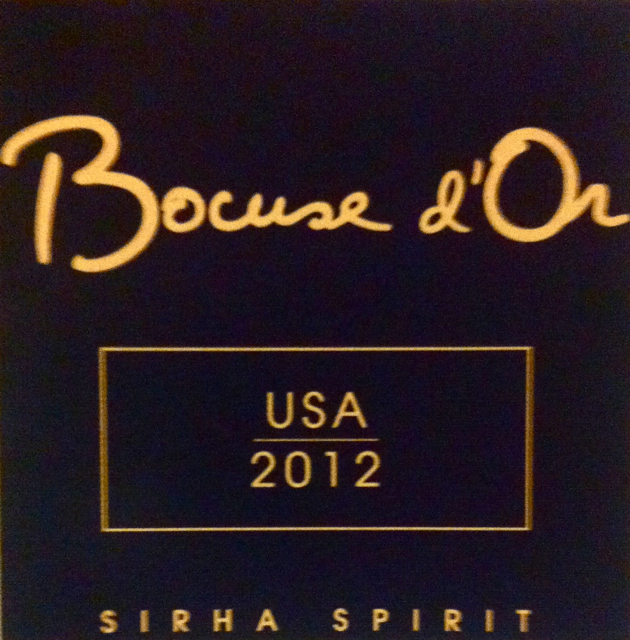 January 29, 2012… my husband John and I attended the Bocuse d’Or USA 2012 competition in Hyde Park, NY. John and I both have a passion for gourmet food, so for us it was like having box seats at the super bowl. The winner, Richard Rosendale, was just announced a couple of hours ago and will represent the USA in the 2013 Bocuse d’Or in Lyon, France — the Olympics of food — one year from now. The judges of the event were culinary royalty, and we met most of them personally. It was one of the most exciting days of my life. As exciting as today was, I can can’t help thinking about one year ago today. January 29, 2011… John and I returned from a business conference and noticed that Julian had some unusual bruises. That was the first night that we sensed that something wasn’t quite right. We didn’t know it then, but we were right on the cusp of the worst thing that could happen to a parent. Oh what a difference a year makes. Some days, like today, it’s relatively easy to choose to go toward happiness. Today, I have the strength to keep the negative emotions at bay, and feel gratitude for the wonderful things that have happened in the past year. 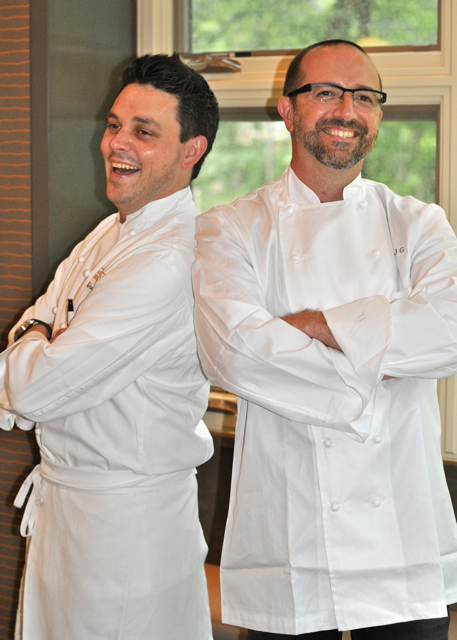 Not the least of which was becoming friends with Chef Gavin Kaysen, who represented the USA in the 2007 Bocuse d’Or and will be the 2013 team’s coach for the coming year. It’s because of Gavin Kaysen that we were able to attend the prestigious event today. And it’s because of Julian that we met Gavin. Here’s how it happened: Last spring shortly after Julian died, my dad was in NYC and went to Gavin’s restaurant because he’s friends with Gavin’s dad and was curious to meet his friend’s famous son. He asked to meet the chef, and they chatted for a while. My dad described how much his daughter and son-in-law appreciate gourmet food, and he also shared Julian’s story. Gavin, being a father of a young son and with another on the way, was moved by our story. As it turned out, Gavin was coming to Minneapolis a few weeks later to cook for a fundraising event. One thing lead to another, and he and my dad came up with a plan for Gavin to come in a day early and prepare a meal at my house as a very special birthday gift from my parents to my husband John. On July 22, 2011, Gavin arrived in Minneapolis and came to our house to spend the day cooking with John, and prepare a wonderful multi-course meal for us and our best foodie friends. We’ve considered him a friend ever since. Our friend, the world-class chef and Bocuse d’Or USA head coach. I share this story for two reasons. First, because it was exciting to see Gavin in his glory this weekend, sitting at the head table with Chef Thomas Keller, Chef Daniel Boulud, and others. And second, because I believe it is important to celebrate the good things. None of us needs to be reminded that sometimes bad things happen to good people. But good things happen to good people, too. Life is full of good things and bad things, big things and small things. The question is, what do I focus on? Do I wallow in my grief and think of January 29, 2011? Or do I feel grateful for the exciting day that was January 29, 2012? Or better yet, do I look forward to John and I joining Gavin in Lyon, France on January 29, 2013? I think you know my answer. I will never forget that I have suffered an irreplaceable loss. But I will not let it prevent me from having a life that includes joy, wonderful new friends, and once-in-a-lifetime experiences. We’ve all heard about the five stages of grief, right? Many of us have them memorized, or could name at least two or three of the stages. But, do we know where they came from? Do we know what they are based on? Does it occur to us to question whether or not they are based on actual research? Nine months ago, my answers would have been no, no, and no. But here I am today, almost nine months after Julian‘s death, with a whole new perspective. As I mentioned in one of my early blog posts, one of the first things I did after I came out of my initial shock was ask a friend, “What are the 5 stages of grief, again?” I wanted a roadmap for my future. I wanted a to-do list. Then, I learned that the theory of “The Five Stages of Grief” — also known as the “Kübler-Ross Model” — is neither based on bereavement nor scientific research. Surprised? I was. So I decided it deserved another blog post. I wasn’t just surprised, I was disappointed when I learned the facts about Kübler-Ross’s five stages. I was mostly disappointed because I liked the idea of having a map or path through this process, which I could follow and track my progress through a journey that by definition (I assumed) had a beginning, middle, and end. But I was also disappointed to learn that these five stages had become conventional wisdom in the field of psychology and mental health without any scientific research to back it up. So who was Elisabeth Kübler-Ross, and where did these five stages come from? In the ’60s, she was one of the first psychologists to dedicate her career to working with terminally ill patients. She became a respected lecturer on the topic of how nurses and doctors could/should interact with their terminal patients. Because of the uniqueness of her work and her lectures, she was offered a book deal. It was then — after signing her book deal, and with a deadline looming — that she came up with the stage theory. I believe that the concern about denial and other judgement is primarily based assumptions about the stages of grief, and society’s expectation that no one should get over the loss of a child (especially a mother). But the truth is, both science and my natural instincts tell me that those people (including Kübler-Ross) are wrong. We all need to re-think and re-discover what grieving really looks like. One of the messages that almost every book about grief will tell you is that holidays are hard, especially the first year. And yes, it’s true. Of course that’s true. But, instead of being consumed with sadness because he wasn’t with us tonight, I decided to focus on being grateful for the Halloweens that he was with us. Tonight, as Oscar was out trick-or-treating with John, I took some time to browse my photo library and revisit the 4 Halloweens of Julian’s too-short life. He always hated getting his picture taken, so his first three Halloweens weren’t documented well. But I’m grateful that he was a good sport last year — the photos I took of him and his brother Oscar are some of my favorites of our whole photo collection. Here are some of my favorites from last year…. So here’s what I have to say about holidays: I don’t expect them to be easy. But I don’t expect them to destroy me, either. Holidays, for me, are about celebrating life and those we love. That won’t change just because one of my loved ones isn’t on the planet anymore. I don’t need grief books to tell me that holidays will be hard — I can decide for myself what holidays will be. I can choose to mourn his absence, or I can choose to celebrate the holidays I had with him. Tonight, I choose the latter. Here it is. Six months. Some call it an “angelversary.” Or as a wise friend said recently, “I like to think of it as his birthday. His new birthday. The day he was born into whatever comes next.” I like that. Happy six-month new birthday, little one. I first saw this chart, and the book that contains it, around the two-month mark. 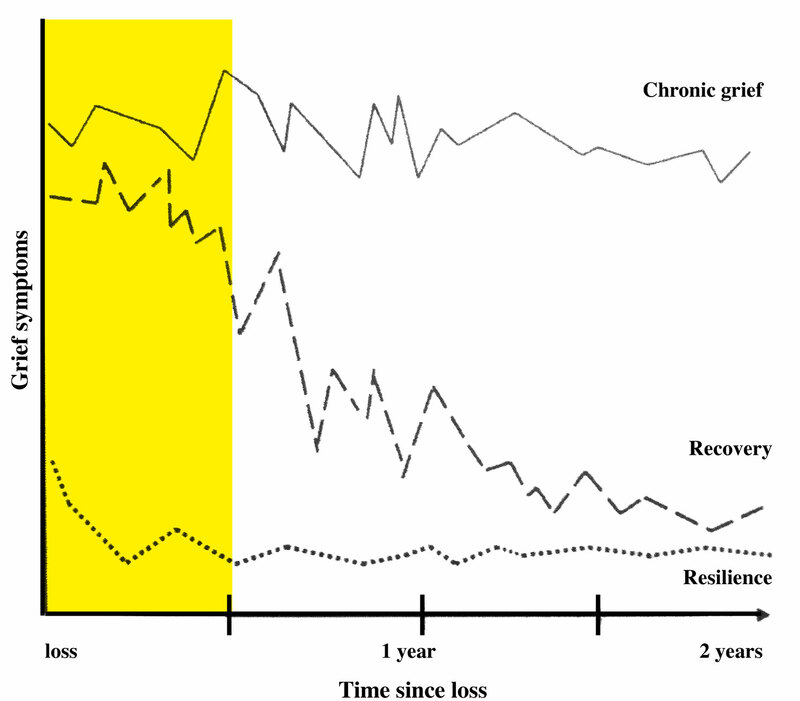 It meant so much to me to learn that science shows that bereaved people fall into one of three categories — chronic grief, recovery, and resilience. Until that point, I’d only found memoirs and books written by therapists that made it seem that most people were chronic grievers who only reached a sense of “recovery” after years of therapy and support groups (if ever). Turns out, many of us — perhaps even most of us — fall into the “resilience” category. It’s hard for researchers to know for sure what the percentages are, because these aren’t the people writing memoirs or visiting therapists for years on end, and therefore aren’t on the radar of the therapists and grief counselors who are writing books about their work. I wrote a lot about The Other Side of Sadness in my two-month blog post, and it seems fitting to revisit it again now. One of the most fascinating details about the scientific research described in this book is that they studied people both before and after their loss. Because of this, the researchers were able to discern the difference between someone who started displaying frequent and prolonged grief symptoms after their loss, vs. someone whose personality and outlook on life was grief-like even before the loss. I’ve now had six months of “facing up to imponderable questions.” I wholeheartedly agree that “the mysteries of life and the nature of the soul is acute during bereavement.” I’ve pondered the imponderable. I’ve inquired into the mysteries of life. I have a new understanding of what it means to be human, and what it means to be alive. If there could possibly be a silver lining to this experience, that’s it. I’ve survived six months of the after. I’ve spent six months creating new normal. I don’t know where I’ll be in 6, 12, and 18 months from now, but I know I’m resilient. And I know my future will be filled with happiness — because I choose to make it that way.